Estro Support ES contains minerals, vitamins and some herbal ingredients, and is indicated to ‘support the needs of menopausal women’. We decided to conduct a little bit of research, and this is what we learned from the little bit of information available. Thiamine– This ingredient has been found helpful in the treatment of stress and aging. Vitamin E- Vitamin E is used commonly for help with painful menstruation and PMS. Riboflavin- Riboflavin, also known as Vitamin B2, can help with migraines, muscle cramps, aging and boosting the immune system. Niacin– Niacin can help improve orgasms, migraines, dizziness and depression. Vitamin B6- This vitamin can help with PMS, memory and boosting your immune system. 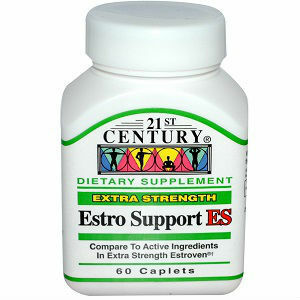 The recommended dosage for Estro Support ES is 2 tablets each day before eating. Estro Support ES has no listed price. Estro Support ES has no known guarantee. Estro Support does not have enough information or documentation to provide any sense of safety when putting it into your body. All that exists are claims for what Estro Support will do, and what they say is in it to make it do just that. Jackie Horowitz	reviewed 21st Century Estro Support ES	on May 20th	 and gave it a rating of 2.